Great Job Guys. Antwon, Kelly, Tommy and the fourth gentleman did a great job. Customer service! From the start of this company took the extra effort to help me with my move. After buying a house they understood I was on a budget. They happend to be completing a move near my old house and were able to save me hundreds of dollars in supplies by dropping off some used boxes. The guys took good care of my furniture. They worked so hard that they completed the job three hours ahead of the estimated time shedding hundreds off the estimated price. Professional crew, fast, efficient, hard working. Very reasonable pricing. Good communication from management. They do a really good job, and the price is reasonable. Movers came right on time and worked quickly and carefully. Before long I was unpacking boxes in my new house! Very professional, fast, and were willing to help out when I came up with a bad situation. Four gentleman helped us move our home efficiently while being careful not to damage anything. Nice staff. Professional movers. On time and helpful the whole 10 hour day. My Guys were very efficient, and pleasant and did a great job for my clients. They appreciated the extra boxes and spending time making sure everything was loaded properly. Showed up on time, courteous and respectful. I definitely recommend! Thank you for moving us so professionally! The crew called to tell me when they were arriving and arrived on time. They did a quick survey of our job and then moved quickly and efficiently. They did whatever we needed them to do and were so very nice. Everything arrived in good shape (no damage) and all our furniture and filling cabinets were placed where we needed them. Moving is not fun, but My Guys made it as easy as possible. We would definitely use them again. Thank you! All of your guys were great to work with and very nice. Dave, Thank you for another great move. I really appreciate you making this process so easy again! These guys did an excellent, efficient job! They were on-time and courteous, and it was great to have their help. I highly recommend them! Were very polite, and made the move quick and effortless. All in all the move was excellent. My move involved moving from one address in Richmond, VA to another local address. My guys was earlier than on time which I appreciated and they moved us within the projected time in a pouring rain storm. Your crew was great, they showed up on time and they completed the work in a timely manner. I called them on a Friday morning and they were able to provide their service for Saturday, the next day. Not only were they prompt and courteous and willing to address my last minute need, there was no damage to any of the items moved. Very professional and reasonably priced. I recommend them highly. My Guys Moving & Storage is wonderful! I’ve used them several times personally, and have referred them to a number of clients–with no complaints ever!! I find their crew to be dependable, professional, courteous, and reliable. They have always taken great care with my furniture and belongings. This is the second time we used My Guys Moving, and Charles and Tyrone, and we were very appreciative of the great care they took to protect our furniture and goods. They were prompt, didn’t waste time, and had a wonderful attitude despite the awful heat and humidity. Thanks guys! Very professional, quick and courteous. They had me estimated as needing four men for eight hours. The crew had the office packed on the truck, delivered to the new address and unloaded in 4.5 hours. They put everything in the new office where I asked them to. Very pleased. Great Experience!! They were on time, worked hard, efficient, respectful, and patient. George the driver moved us last time and that move went great just like this move. This is the third time we have use My Guys and I do recommended them to friends and coworkers. They arrived between the promised time slot. The men were very professional and started immediately. My move went very smoothly. All my furniture and other items was placed in the new rooms, all labeled boxes was put in the designated areas and nothing was dinged, banged or ruined. 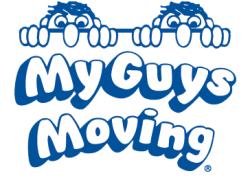 I am so happy to share that my moving experience with My Guys Moving and Storage was a pleasant experience. They came in the proposed time period and the “guys” were pleasant and courteous as well as professional. Also, my estimate was almost perfect. I highly recommend this moving company. My Guys Moving &amp; Storage is wonderful! I’ve used them several times personally, and have referred them to a number of clients–with no complaints ever! !I find their crew to be dependable, professional, courteous, and reliable. They have always taken great care with my furniture and belongings. We moved in mid-January 2014 and called My Guys b/c they were rated No. 1 by Richmond Magazine. We could not have been more pleased. Charles, Ishmael and Guy were nothing short of fabulous — professional, thorough, patient, and extremely hard-working. I was especially worried about my sewing furniture which can be complicated. Not one piece of furniture was damaged – NOT A SINGLE SCRATCH. These guys know what they’re doing. Our move was supposed to take about 5 hours but ended up taking all day and into the evening. They just kept going and going. After 25 years in our previous home, moving was extremely stressful for us. It is not something we want to do again, but this could not have been a better experience. I give these guys the highest possible rating (and anyone who knows me would agree I am extremely particular). These guys were fabulous. I will recommend them to everyone. Thanks for a great moving experience.